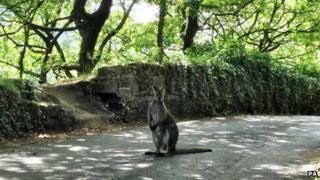 A driver said he had "the shock of my life" when he saw a wallaby jumping along a road in the Yorkshire Pennines. The sighting of the Australian marsupial was on Marsden Lane, near the village of Slaithwaite, outside Huddersfield. The driver who took a picture of the animal said: "I kept sounding my horn but it wouldn't move." The animal is believed to have escaped from a local farm where three wallabies are kept as pets. According to the unnamed witness, after a while sitting in the middle of the road the animal "just skipped off". West Yorkshire Police said they have had no reports of wallaby-related road incidents.